The (insert date here) Wedding for _______ ______ and _______ ______ will be held on the Island of ______. Insert Story Here on Wedding Couple. For travel advise and bookings please call Mark Steffan at 1-808-268-8339. 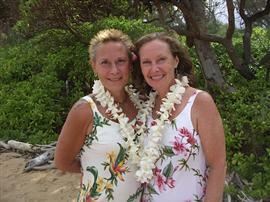 Mark Steffan is our wedding planner Hawaii travel specialist. Please feel free to contact him about accommodations, travel, etc. Reception to follow immediately after the wedding at Tidepools restaurant within the Grand Hyatt. These directions are from the airport. Please orient yourself. For most people get yourself to the Kuhio Highway and go south. Pass the Hyatt entrance and make your next right, go past the golf club and go to end of drive at beach parking lot.